Fantastic finish girls! The BH girls varsity team placed 5th overall among the NY teams, with Lindsay being the first BH runner to cross the finish, followed by Emily, Jordan, Meagan and Alexis, all in the top 50, and Eva and Sheila close by. In the Open NY/NE girls race, the BH girls team won! Josette, Erika, Marina, Gigi and Sarah K all placed in the top 20, with Mary M only one place back and Dani rounding out the team. So proud of you all! Thank you for joining us in celebrating the 2012 XC season! It was a beautiful, sunny, yet chilly day as the BH Varsity Girls and Boys headed to the NYS Federation XC Championships at Bowdoin Park. The BH girls, led across the finish by Emily, with Lindsay, Jordan and Meagan close behind, and Eva, Alexis and Sheila not far, came in 3rd overall behind two strong Section 2 teams. Terrific finish girls! The boys, led by John, Patrick and Joe, all finished within 1 minute of each other for an overall 20th. Very nice efforts out there. A great day of running and lots of BH pride as Emily, Lindsay, Jordan, Meagan, John and Patrick, along with their coaches, family and teammates made the trek to western NY for the State Championships. You did great! Very strong 2nd place finishes for both the Boys and Girls teams in Class B, and 3rd overall, against very tough Section 2 teams. You gave it your all, you ran super, we are all so proud of you. Congratulations to Emily, Jordan, Meagan, Lindsay, John and Patrick who are heading to the State Championships on Saturday! The final meet of the regular season brought some really great running. Congratulations to all! The last dual meet of the season brought wins for the Varsity Girls and a split for the Varsity Boys. For race results check out the BH Invitational link. Over 70 schools came together on a beautiful day that started out cold and frosty but gave way to blue skies, sunshine and great temps for running. Thank you to everyone that helped put on this event, and thank you to all the participants for coming. If you missed out on getting a BH Invy shirt, we still have some pink short-sleeved shirts in ladies medium and large. Cost is $20. Contact trackclub@bhblrunners.com. For the Burnt Hills teams, a huge congratulations to the Varsity Girls, JV Girls and Freshman Girls for winning each of their races against excellent competition. For the boys, it was a win for the Freshman, and 6th place finishes for both the JV and Varsity teams. These were some fast races that produced new PR’s for many. Congratulations to all! Wins across the board for both Varsity Girls and Varsity Boys. What a day!! The mild temperatures and dry course lended well to fast running and some big PR’s. At the end of the day, the girls’ teams had won all 3 of their races! Impressive! Lindsay Bachus (18:59) and Marina Jerry(19:09) placed 3rd and 4th in the Sophomore race, with the rest of the team not far behind. Erika Frees WON the JV girls race in 18:58 with 423 runners behind her and the next 4 BH runners in the top 20! Congratulations Erika! The Varsity girls were flying, led by Jordan Casey (17:52) in 7th, Meagan Roecker(17:52) in 8th and Emily Digman(17:54, 1:33 PR) in 10th. The JV boys came in 3rd of 29 teams, led by Trevor Drapeau in 2nd place with a time of 16:39 (2:26 PR), and the Varsity boys were 5th of 19 teams in a fast-paced race. John Rabideau led the BH runners in 16th with a time of 15:37, and Jared (15:49), Patrick(15:50) and Fro Joe(15:55) close behind. Great teamwork! It was a clean sweep for all three girls’ teams!! 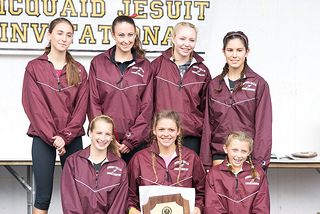 The Freshman girls led it off with all 6 girls in the top 20. Wow! For the JV race it was a 1-2 finish by Schuyler Pruyn (20:43) and Josette Meserre(20:53 ) with the team finishing 21 points ahead of Champlain Valley. The Varsity Elite team led by Jordan Casey and Emily Digman in 6th (19:31) and 7th (19:32), ended in a tie with Champlain Valley but Sheila Bashant’s fast 6th runner finish tipped the win to Burnt Hills! Way to go girls!! While the girls headed east where the day stayed sunny, the boys went west where some showers and downpours between the sun made for variable and muddy conditions. The boys were up for the challenge though with Michael Bashant bringing home the win in the JV ‘B’ race in 17:34 and a 2nd place finish for the team. Way to go! 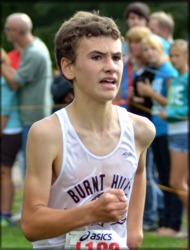 Robert Kirsty led the BH runners in the JV ‘A’ race, coming in 8th(17:23) and, in sloppy conditions, Fro Joe Girard, Patrick McGuinness and Jared Short came in 10th (16:21), 13th (16:24) and 15th (16:26) to lead the Varsity team to a 4th place finish of 13 teams. A day later and a beautiful day for running! Wins for both the Varsity Girls and Boys! 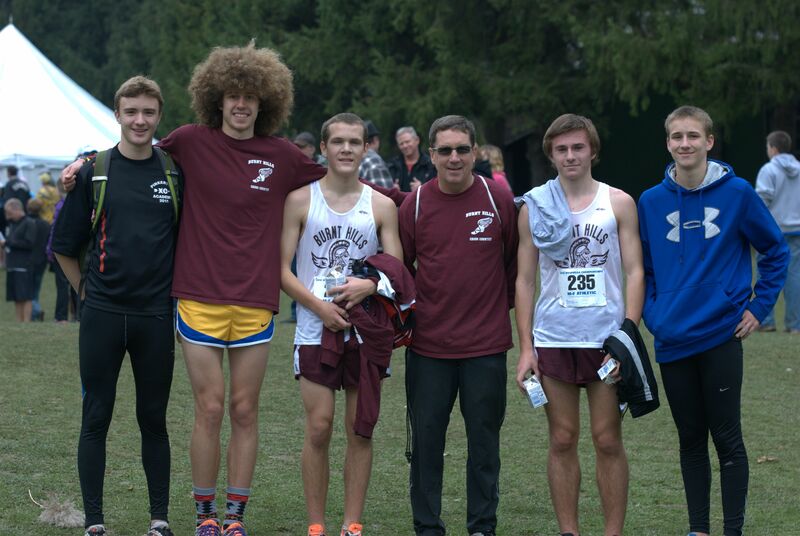 The Spartan boys traveled to Tawasentha Park for the Guilderland Invitational on a warm, humid and breezy day. No mud this year so it was a return to the traditional course and the big downhill finish! The Freshman, JV and Varsity teams ran very well against some strong competition to come in 2nd, 4th and 2nd. Congratulations to all runners! Results | BH-BL Results Click on the above image for more photos. The JV and Varsity boys headed to Fonda-Fultonville HS for their first meet of the season. Congratulations to all on a great start! Come to meet the teams, coaches and XC and Track Club. Hear about how the club supports the team throughout the season; sign-up to volunteer; BHBL XC and track magnets ($5) and license plate frames ($6) will be available for purchase; return track club membership form (dues $20/season or $50/year) and driver authorization form. Forms can be downloaded here or will be available at Meet the Team Night.